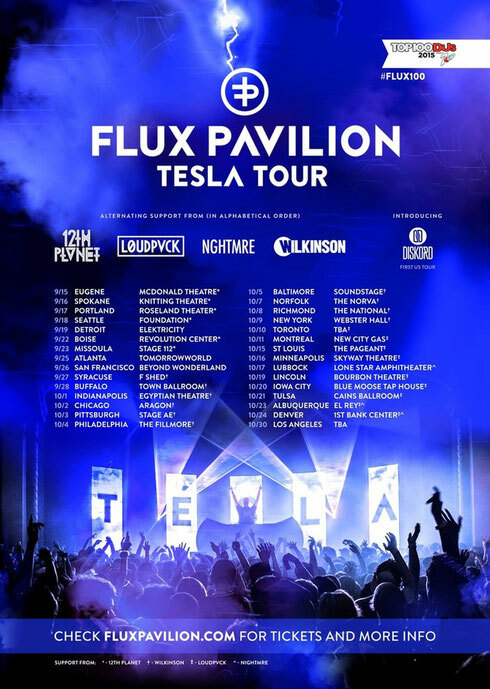 This September will see the release of Flux Pavilion’s debut album, ‘Tesla’, with the artist taking his new show on the road with a two month Autumn/Fall tour of North America. He’ll be joined by a selection of headliners on selected dates including 12TH Planet, Loudpvck, Wilkinson, NGHTMRE and DISKORD. ‘Tesla’, out 4 September on Circus Records, will feature guests including collaborations with ‘80s Hip hop artists Soul Sonic Force from the eminent Afrikaa Bambaataa & the Soul Sonic Force crew plus Wilkinson’s ‘Half Light’ vocalist Tom Cane, among many others. The album is named after the electrifying measurement of magnetic flux, so clubbers can expect loud and bright excitement for the forthcoming tour!